ReadWriteWeb published today a list of the most popular Twitter apps according to the blogosphere. They ranked them according to different criteria: overall, desktop apps, mobile apps, and web apps. I chose to only show the top 5 Twitter mobile apps. Visit ReadWriteWeb for the full list. 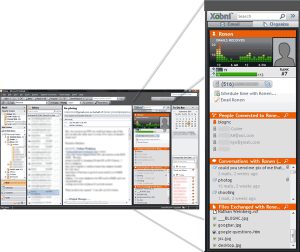 Xobni (“inbox” spelled backwards and pronounced zob-nee) has produced a free downloadable software that, once installed, indexes all the e-mail in Outlook and makes those messages quickly and easily searchable. The most useful part of Xobni is how it indexes and threads content. The program lists emails in “conversations” a la Gmail, so you’ll see all the back-and-forth replies to any message together in one window within Outlook (Xobni runs as a sidebar inside the program). Having all that info so readily available, without even having to navigate away from your current message is quite convenient. Xobni also saves you time on searching for those old email attachments. When you have an email open, Xobni’s displays a box that shows you every single file you’ve ever exchanged with a person and lets you easily access them. Another neat feature is you get all their contact info, including phone numbers extracted from their past emails. Xobni will pull their digits from their signature and save them for you, without you ever having to do a thing. The company was founded by two former graduate students who met on internships in Washington in 2006. Last year the co-founders went through a Silicon Valley start-up boot camp, called Y Combinator, where they received an initial investment and temporary offices.